Have you thought of adding Headlight Repair to your auto detailing business? A new set of sealed beam headlights on a New Jeep Cherokee could run as high as $70, however your team can make money lightly sanding and coating these headlights with the Micro-Glass product in the Micro-Mesh Kit by Micro Surface Corporation. It is important for the detailing companies to constantly review such products, this innovation has propelled our team to come up with the solutions for our fleet customers and help us bundle services to compete against the other large vendors to these fleet companies. One company we compete with out of New Jersey does offer this service, but we do and we are able to use this to our advantage on bidding on fleet detailing work. 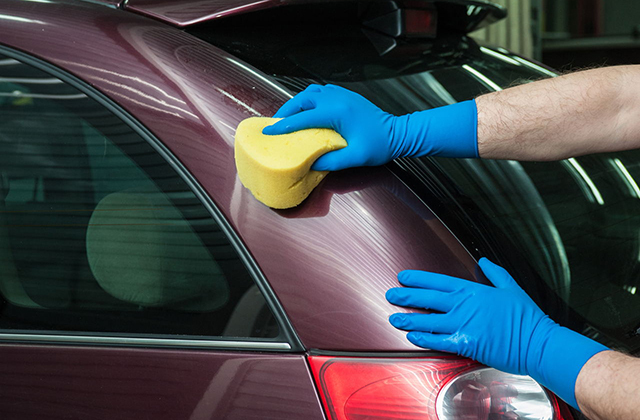 Interior and exterior car detailing supplies goes steps beyond standard car washing. This is just one more way you can bundle services to provide a value added service to your customers. We have talked to managers of fleet wash companies and fleet detailing companies in their various markets. Some of these managers have told us they have been looking into doing headlight restoration, because their customers are now asking for the service. Many of the high-end to Auto detailing shops do offer headlight restoration using various methods. Recently with the floods that we’ve had in the United States, we have seen Auto auctions start to offer this service also. Generally the Auto auctions that we’ve seen do not know how to deal with sealed beams, instead they’re much better with none sealed beams, and by removing the lens and wiping down the inside and using glass wax they are able to make the lenses look transparent and therefore the car looks sellable as runs through the auto auctions. Whereas this is a good idea for auto auctions it is not good enough for the fleet customers especially those that assign their cars to specific individuals. Companies like the Baby Bells, quest, Cox cable, AT&T, FedEx, United States Postal Service etc. have thousands and thousands of vehicles. Generally these vehicles are assigned for the most part with very few as a percentage of the total fleet being pool cars like at the GSA office. As the vehicles get back from Iraq and Kuwait and were ever they do next to wipe out terrorism from the face of the planet, they will have sand blasted headlights, from the very fine silica type sand of the Middle East. So how does one go about taking care of this problem? Well, it is much simpler than you think. The first thing to do is to assess exactly how bad the damage it is this can be done in a number of ways; first, you would get the opaqueness or cloudiness of the lens. Second, you look to see if there’s any pit marks and hard water spots. This is how you assess which method you’ll use to either clean or restore the surface. Let’s face it if there’s too much damage, the time it will take to fix the lens will cost you more than to replace it. The micromesh is cool because you can use it either wet or dry when you’re sanding. How much do most detailers charge for this service? Well in depends the tupe of vehicles and locations of the fleets; vans such bread companies, wholesale companies, small package delivery companies, online grocery services, dry cleaners, flower shops, armored car services, limo services, school buses, garbage trucks any other fleets mentioned above, we have found that is not difficult to get 8 to $10 per lens, remember each of the service trucks or cars have between two and for lenses. This can add up to quite a lot of money very quickly. We have also found that used car dealerships will go for it once you show them how it works. We also found it to be a nice add-on to keep our crews busy in inclement weather. Take note as you know the Northeast United States has been slammed by snowstorms and Nor-Easters, these additional services provide an extra revenue generator when wash cars. There is a great article in TSP magazine in the October — November 2003 edition about this product and ease of use. The micromesh soft touch pads are only three by four inches with a phone center but they were killer since they have micromesh upon both sides. When using them they bend with the lens as you’re working so you can go fast with even pressure. We found that we could clean, micromesh, white and buff a lens in about six to eight minutes. If you’re working indoors on a fleet of vehicles in the winter in the northern colder climates of the US or Canada you can make money no matter what the weather is in this is just one more way we are solving the problem of continuing sales with a mobile carwash or mobile detailing rig in the harsh winter weather climates. By using the micromesh can’t it cuts down the time to do the job significantly. The old way was to use different levels of fine grit sandpaper slowly working up. For instance starting with a 1000 grit and working upwards to 12,000 grit in a micro fiber. This is great if you’re restoring your car, but it just wasn’t worth it if you’re detailing one. Another company which recommends using the product is Bud Abram’s detail plus: http://www.DetailPlus.com which I believe also sells these Kit’s. You should take a look at the micromesh product and its uses and think about using this as an add-on for your existing auto detailing business.